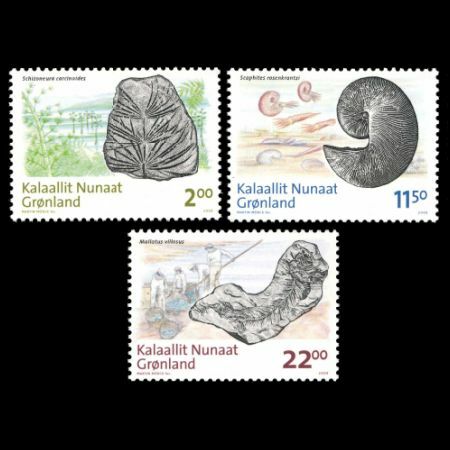 "This is the second and fnal part of Post Green-lands series about fossils in Greenland and consists of three stamps demonstrating aspects of the extensive and exciting fossil record of Greenland. The second group of images continues our journey through some of the key events in the history of life on our planet, beautifully illustrated by yet more unique fossils. These three fossils, a plant, an invertebrate and a vertebrate, are from the younger part of the fossil record, ranging from about 200 million to just some 8,000 years ago. Schizoneura carcinoides One of the fve big mass extinction events occur-red some 200 million years ago at the boundary between the Triassic and Jurassic geological systems. 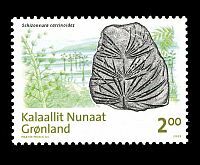 Beautifully-preserved plant fossils have been known for many years from Jameson Land in East Greenland derived from ancient forests that survived this extinction event. The horsetail Schizoneura carcinoides, with its distinctive spiky leaves, grew in marshes and if present in suffcient numbers could generate coal. In East Greenland these plants were common near Scoresby Sound and were frst described over 70 years ago. Now they are helping scientists assess climate change during the mass extinction event. Mallotus villosus or the capelin is a small smelly fsh, common today in the Arctic seas, prized for its roe but also as a base for fsh meal. 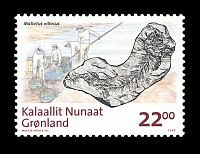 The capelin, however, is also found as fossils in the Quaternary sediments of West Greenland, some nearly 8,000 years old, appearing identical to its living relatives. 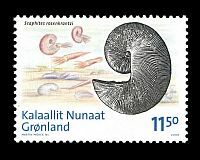 These fossils were brought to the attention of scientists in Europe more than 200 years ago by whalers, who probably collected them from localities such as the head of Sndre Strmfjord, where they are still common today. Scaphites rosenkrantzi The end of the Cretaceous extinction period, 65 mil-lion years ago, is better known since it is linked to a massive environmental catastrophe associated with the impact of a giant asteroid and major volcanic eruptions. During this period the dinosaurs and various types of giant marine reptiles, such as the mosasaurs and plesiosaurs, disappeared from Earth for ever. David Harper is Professor of Palaeontology, University of Copenhagen and is in charge of the palaeontological collections in the Geology Department, Natural History Museum of Denmark, University of Copenhagen. He is also head of the Geology Research Group at the museum. 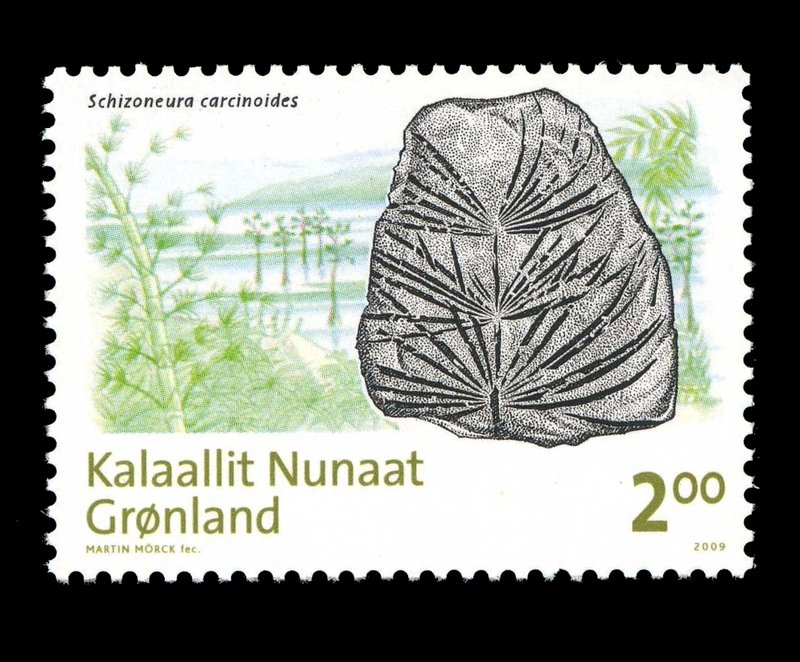 His research is feld and specimen-based, focused on the Lower Paleozoic rocks and fossils of Greenland, Scandinavia, the British Isles and China. 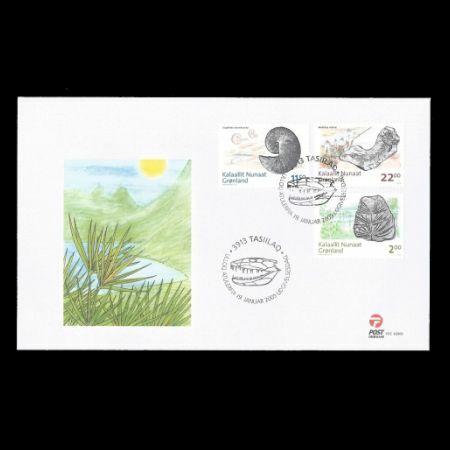 He is currently Chair of the Publications Board (Palaeontological Association), President of the International Palaeontological Association and Chairman of the International Sub commission on the Ordovician System. Bent Lindow is a palaeontologist at the Natural History Museum of Denmark (University of Copenhagen). He studies the evolution of birds and how it was infuenced by prehistoric climate change. Bent has given numerous lectures and participated in radio- and TV-interviews on palaeontology and the evolution of life in Denmark and abroad.